The Cumaru Pousada is situated on Stated Of Amazonas/Brazil downstream Urubu River 250 km away from city of Manaus by 4 hours driving on paved and dirt road. It was inaugurated in September 2016 and was created by me (Antonio Gomes) as I hired local labor for the construction. The structure was made in regional style with artistic painting. There is a restaurant to enjoy delicious regional meals prepared by local family. All of the rooms are built with a balcony facing the river that provides a fantastic view for the guests. It has 2 rooms with a double bed + 1 single bed, 1 room with 3 single beds and 1 dormitory with 3 bunk beds. The bathrooms and toilets are outside of the rooms. 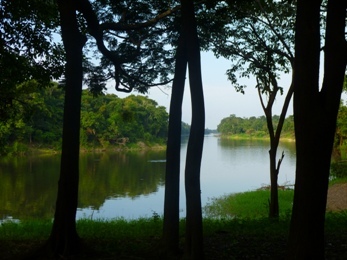 The proposal of the Pousada is to promote the development of the local people's economy and integrate them into responsible ecotourism by providing a unique experience for wildlife spotting in several tours to have contact with the biodiversity influenced by wetland of the Amazon River. Thereafter the alkaline water from this area increase the number of insect especially the mosquitoes but the nature compensates us with the beauty of landscape and variety of animals. Access the page of tour.